Most Riverside, NJ homeowners know very little about mold, unless they have encountered a mold problem before. As a result, uncovering prolific mold activity can easily overwhelm home and business owners. Mold should always be approached with a sense of urgency. Mold is a toxic bio-contaminant that should, in a majority of cases, be handled by a professional mold removal company in Burlington County, NJ. 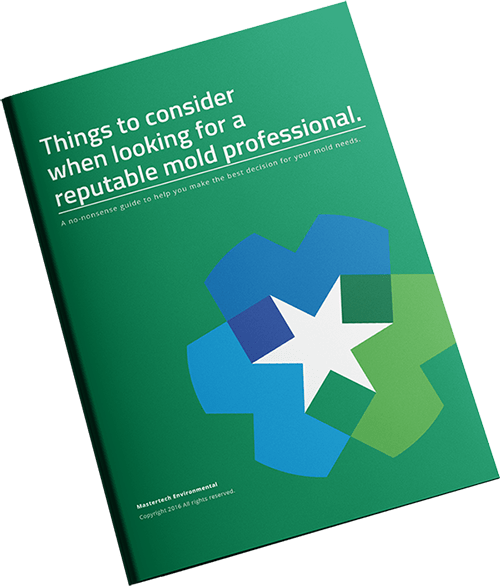 While mold cases can range from mild to severe, only a mold inspection, conducted by a certified professional, can determine, for sure, the full extent of the mold problem, should a mold problem exist. Minor mold growth in your Riverside, NJ can quickly escalate and develop into a major problem. The moment a adequate water source is introduced, it only takes 24-48 hours for mold to start spreading throughout your property. It is important to take immediate action upon discovering sign of potential mold development. If mold is given the opportunity to colonize your home or business, it will eat away at your property and compromise the structural integrity and property value. In addition, exposure to mold could lead to health issues ranging from symptoms as mild as common allergy symptoms to severe respiratory issues. If you are encountering signs of mold growth, call a professional to complete a certified mold inspection in Riverside, NJ. MasterTech inspectors are meticulously trained to provide you with the most thorough and non-invasive mold inspection possible. A MasterTech inspection will determine if you have mold, how bad it is, how to properly get rid of it and how to prevent it from returning. 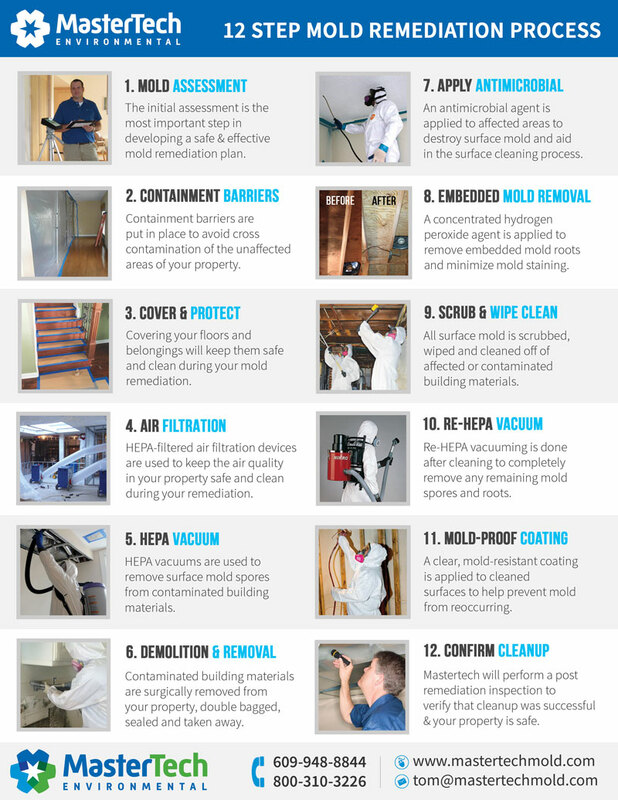 Mastertech’s mold removal and remediation process is second to none. Using years of industry experience and incorporating some of the safest and most effective removal techniques available, our team of experts have been able to establish a detailed mold removal and remediation process. After completing a mold remediation in Riverside, NJ, we are confident that you and your family will return to a clean and SAFE home in New Jersey. The MasterTech standard for every New Jersey mold remediation is getting the job done right the first time. Because, when it comes to mold, a bad remediation can mean health implications for you and your family and property damage to your Riverside, NJ home. For quality control purposes, we always conduct a post-remediation inspection with testing to confirm the job was done right. We also back every mold remediation with a 5-year mold-free warranty. It is our promise that the mold has been properly removed, and it will not grow back. When it comes to mold, you can be putting yourself, your family, and your home at great risk. Do not settle for just any mold remediation company. Take the time to do your research and find a mold removal company in Riverside, NJ that you can trust to put you and your family’s safety and well-being first. A mold remediation that is completed poorly or improperly can leave you with more health threats and property damage. If you suspect mold development in your home or business, call MasterTech to ask about mold inspections in Burlington County, NJ. For mold inspection and mold removal in Southampton, NJ or mold inspection and mold removal in Hainesport, NJ, call 1-800-310-3226 to speak to a member of the MasterTech Team today!